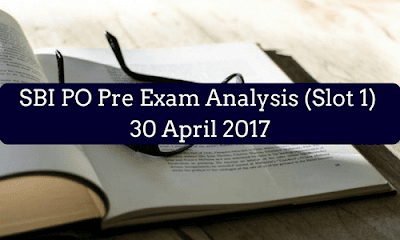 SBI PO Prelims First Slot of 30th April is over and we are here with the detailed exam analysis. Alike the yesterday's slots, the first slot of today was varying between easy to moderate level of questions and according to us the ideal attempt for the thus slot should be 65-70 questions. According to our exam analysis, the overall exam was not very difficult for the students. The English section came with a surprise again with phrase replacement. Students were quite prepared as the yesterday's exam had the similar kind of questions. English section always demands utmost practice and strengthened vocabulary. Today students who were not ready to face the phrase replacement questions found to attempt the questions. The reading comprehension passage had difficult vocabulary questions. The RC passage was based on cyber security and cloze test was based on Education system in India. The QA section which is entirely based on short-cut tricks and formulae decides the fate of you. In today's exam, DI questions based on Table were easy and Bar Graph questions were moderate. The ideal attempt for this section is 18-24.